Nash Overstreet just released his EP U Don’t Get 2 Do That and we have an exclusive acoustic version of the title track! 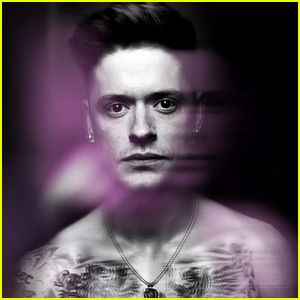 The 31-year-old singer is launching his solo career after a successful run with the band Hot Chelle Rae. Go download the new EP on iTunes and hear the stream below via Spotify! Victoria Justice & Reeve Carney Couple Up in the Together Sweater at Just Jared's Holiday Party! Victoria Justice and Reeve Carney make the cutest couple while posing in the “together sweater” at Just Jared’s Holiday Party presented by Propel’s Star Wars Battle Drones. The Rocky Horror Picture Show co-stars were joined by their siblings Madison Reed and Zane Carney at the event on Monday (December 19) at a private residence in Beverly Hills, Calif.
We had some other great musical talent at the event like Frankie, Pia Toscano with fiance Jimmy R.O. Smith, and Nash Overstreet. The stars got the chance to test out the super cool new drones, which are available in three models – the 74-Z Speeder Bike, the T-65 X-Wing Starfighter, and the Tie Advanced X1. Go order one for yourself now! 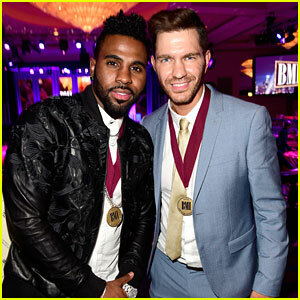 Jason Derulo and Andy Grammer show off their medals inside the 2016 BMI Pop Awards held at the Beverly Wilshire Four Seasons Hotel on Tuesday night (May 10) in Beverly Hills, Calif. The two singer/songwriters were joined by Cher Lloyd and Rachel Platten at the event, plus Karmin, Nash Overstreet and Ruby B. This years awards also honored Taylor Swift and songwriting duo Mann & Weil. FYI: Cher is wearing a Kookai Australia dress with Stuart Weitzman boots and Borgioni and Le Vian diamond rings. Rachel is wearing a Milly jumpsuit and carrying a Nancy Gonzalez clutch.